He must really love that Floatzen soundtrack. Hahaha, awesome. I feel like watching Dwayne Johnson doing a lip sync for "I shake it off" again XD. Egads. I feel sorry for anyone in precinct one today. Chief Bogo: Life isn't some cartoon musical where you break into song, and suddenly, your dreams magically come true. So, let it go! Bobo: Wh-what are you doing with that camera? Me: Oh just something embarrassing for you so I could use for leverage. XD! And we thought he said 'life isn't a cartoon where you sing a little song and your insipid dreams magically come true'. He thought of that before. Just don't sing that in front of Weaseltown. Hmm...how did he get there. Can't stop the wool anymore! Turn around and ram the door! 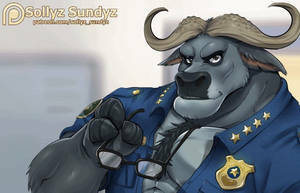 Chief Bogo confirmed for Def Leppard fan, then?